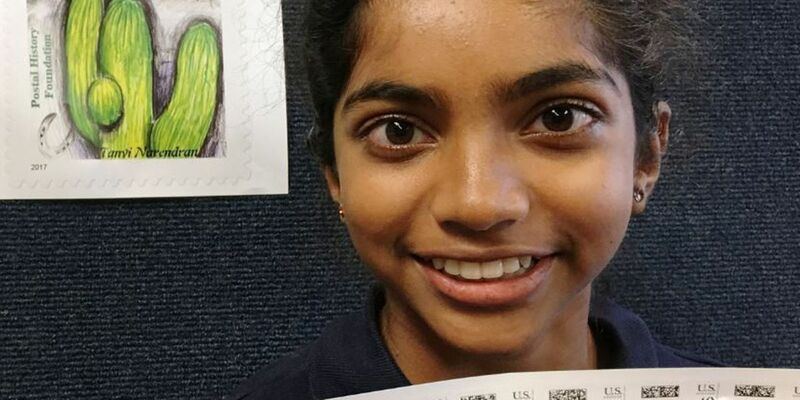 TUCSON, AZ (Tucson News Now) - In a ceremony Friday, August 18, Tucson Mayor Jonathan Rothschild announced the grand prize winner of the 10th Annual Tucson Birthday Stamp Design contest. Tanvi Narendran, an 8th grader at St. Michael's School brought home the big prize, with her unique take on two Arizona icons. A saguaro in the front and historic Mission San Xavier del Bac in the background. The 13-year-old stated she felt "the San Xavier Mission was a great representation of Tucson and she knew that if she added something in the foreground it would add depth to the picture." The top five winners from three age groups were given awards and prizes today at the ceremony. Every student was given a Bookmans gift certificate (donated by Bookmans), collectable stamps, and other prizes. Age 5-8: Addison Sharpe and Embry Vilchis, both from Tanque Verde Elementary. Age 9-12: Lee MacDonald and Maximus Rose, both are home schooled. Age 13-17: Nataly Islas of Salpointe High School and Colin Lee of Leman Academy of Excellence. Interested in purchasing the winning stamp or other designs? You can buy or order them from the Postal History Foundation for $1.50 per stamp, with the proceeds benefiting the Youth Education Thru Stamps (YES) program at the PHF. YES supports teachers and students both locally and across the U.S. with lessons and stamps for classroom use. Collectible envelopes can be purchased for $0.50 per envelope. Postal History Foundation hours are Monday through Friday from 8 am to 3 pm or contact Lisa Dembowski, Education Director, at 520-623-6652 x 102 to order over the phone or email her at education@phftucson.org. The top fifteen winners will be on exhibit at the Postal History Foundation until the 2018 Awards ceremony next year.